Despite all cynicism and doubts following the appointment of Unai Emery as the new Arsenal boss to succeed iconic Arsene Wenger, an incredible start to this season is inspiring the Gunners to chase down a Champions League berth having missed it out on the past two seasons. Their attacking third is in stupendous form, so is the midfield following the inclusion of Lucas Torreira and teenager Mattéo Guendouzi. But the ‘back four’ has been underwhelming compared to the advancement in other areas, and the gaffer should look to strengthen the backline in upcoming windows despite promoting Julio Pleguezuelo from academy ranks in their recent EFL Cup victory against Blackpool. 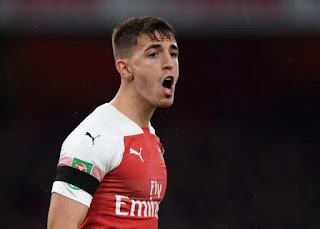 The 21-year-old Spaniard had glittering youth spells with Espanyol, Atletico Madrid and Barcelona before moving to North London and soon received the captain’s armband for the U21s establishing himself as a prized asset of the prestigious Gunners’ academy. Although a centre-back, Pleguezuelo showed his ability to perform as a right-back as well as a defensive midfielder and is now eyeing more senior minutes with a busy schedule ahead. He had a couple of loan spells with Mallorca and Gimnàstic in Segunda División but rejected multiple offers to return to his homeland to make his mark in English football. The former Spain youth international is currently behind Shkodran Mustafi, Sokratis Papastathopoulos and Rob Holding in the pecking order with veteran Laurent Koscielny yet to return to the first-team action recovering from his injury woe. Also, an injury to Konstantinos Mavropanos allowed Pleguezuelo to earn his senior debut in Gunners colours, and the defender is unsure of his future amid speculations of another loan move in winter. At 21, the clock is ticking for Pleguezuelo at Emirates who might still earn a couple more starts against FC Vorskla and Qarabag in Europa League having already qualified for the next round. With Koscielny and Sokratis in their thirties, Emery needs long-term resolution in deep defence, and despite some promising outings, neither Mustafi nor Holding has done enough to earn the manager’s trust for years to come. Arsenal, therefore, should splash the cash in upcoming windows for defensive reinforcements which would further jeopardise the Spaniard’s promising future at the North London club. The Gunners are running out of time having done enough experiments at the back already and the youngster, too, should keep his options open to flourish in senior football.